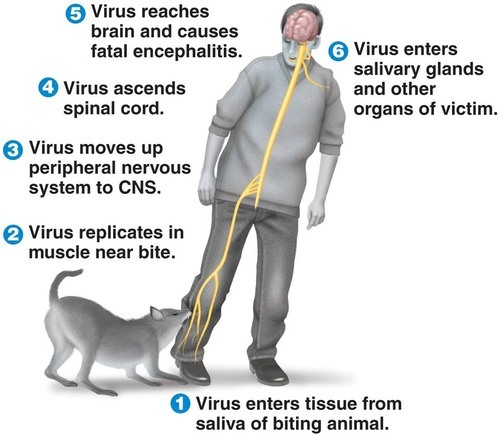 Rabies is a deadly virus that attacks the CNS (central nervous system) and causes acute encephalitis. It is transmitted from animals to humans (zoonotic), most commonly by animal bites - although, there have been cases of humans becoming infected in bat caves after breathing in the air. Rabies is a viral infection spread via saliva. If someone presents with rabies symptoms, it is almost always fatal. In countries where stray dogs are present in large numbers, they are the biggest rabies threat. Predominantly, in the US, rabies is spread by raccoons, coyotes, bats, skunks and foxes.2 Bats carrying rabies have been found in all 48 contiguous states. It is now known that any mammal can harbor and transmit the virus. However, smaller mammals such as rodents very rarely become infected or transmit rabies. The symptoms of rabies can present themselves just a few days after a bite, or they might take as long as 12 weeks. Some rare cases report a number of years between the bite and the onset of symptoms. If you are bitten by a wild animal, it is essential that you seek medical advice as soon as possible. When the initial symptoms of rabies occur, they can be similar to flu and last 2-12 days, becoming progressively stronger. Rabies is a virus and, as mentioned, it is predominantly spread by a bite from aninfected animal. At the time of a bite, there is no way to tell for sure whether an animal is rabid, or whether it has infected you. The doctor will suggest moving straight to treatment; there is no benefit in waiting. The rabies virus can enter the peripheral nervous system directly and migrate to the brain, or it can replicate within muscle tissue (safe from the host's immune system) and enter the nervous system through the neuromuscular junctions. Once within the nervous system, the virus produces acute inflammation of the brain, swiftly causing coma followed by death. As the disease is generally fatal (although a small number of people have survived), there is no treatment for the illness per se. Once symptoms have arisen, there are no medications that can provide help. Rabies used to be referred to as hydrophobia because of the fear of water produced in sufferers. Intense spasms in the throat are triggered when trying to swallow. In fact, the spasms can be triggered by the mere thought of swallowing water, hence the fear. Excess saliva is produced, probably due to the rabies virus assimilating in the salivary glands. If the individual were able to swallow saliva easily, the virus' chance of moving to a new host would be minimized. Because rabies is such an adept killer, many nations have carried out projects in an effort to wipe out, or at least minimize, the amount of rabies in their animal populations. These projects can includewidespread vaccinations of humans in affected areas or simply the dissemination of educational information to remote populations.